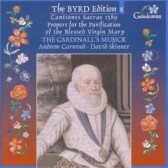 The remaining eight motets from the 1589 Cantiones Sacrae are found on this disc, the eighth in the series devoted to William Byrd. As with the companion disc (vol. 7), Byrd is pre-occupied with the distressed state of Catholics in late-sixteenth-century England, expressed with devstating effect in the famous Ne irascaris and Civitas sancti tui. Yet there is always hope and the setting of Vigilate and Laetentur caeli bring some comfort to the Catholic community. From the Gradualia cycle, here is all the music for the feast of the Purification or Candlemas. Byrd seems to have enjoyed this feast or at least was required to produce a lot of music for it, as it is certainly comprehensive. A full set of Mass propers with a procession and two motets for Vespers. A true musical and liturgical feast! All small ensembles should listen to this recording, learn what is required of them and aim to sing with the same technical skill, understanding, cohesive beauty, and sheer performing panache of this astonishing group.